Rottenlead: Old Crow 15mm - Workshop visit. Old Crow 15mm - Workshop visit. Tonight I visited the workshop of Old Crow Models in the UK. They have a workshop near Croydon, South of London and I had a tour of the facilities whilst looking at some of the new models and production methods used. Jez the owner of Old Crow showed me various models in progress and some of the interesting materials used for initial model making before they are cast into final production. 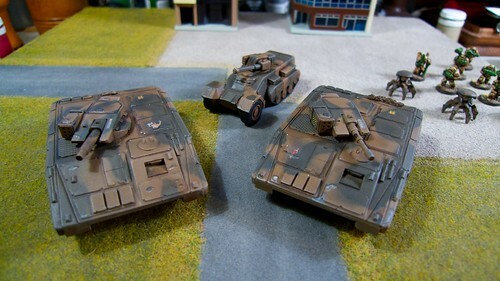 One of the most interesting items in the line up was the 6mm Hammers Slammers tanks which look stunning. If you are a fan of Hammers Slammers you will find the models are almost identical in detail levels to their bigger 15mm and 28mm versions. Some of the models in the photo below are pre-production casts and the metal versions here with the limited detail on the skirts are being replaced with fully detailed resin casts which are nearly ready to be loaded on the web site. The hover skirts detail is on all of the final production models which are stunning and are a combination of a resin hull and metal turret. 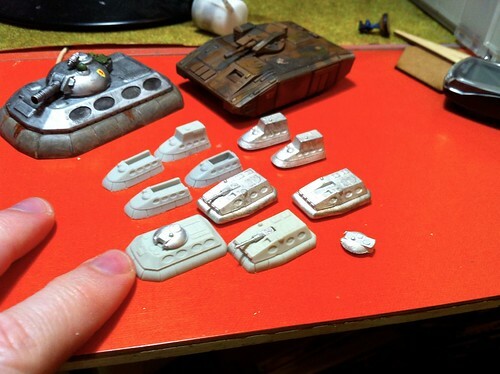 You can see some of the 15mm range here with two Tracked APC's above and the Dragoon halftrack sporting a nifty RAC, which has two detailed metal wheels fitting onto the resin half-track hull. Here are the profile cards for the two Old Crow models detailed. 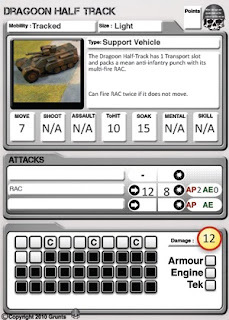 You can see how the 12 damage points on the Dragoon can not match the Lancer with 20 damage blocks, so the heavier Lancer APC is going to be on the battlefield for longer before it is totalled. 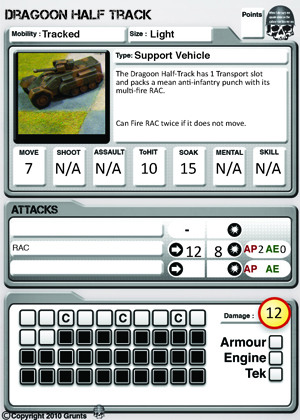 The Rotary Auto Canon (RAC) on the Dragoon also provides a rapid fire option for anti infantry fire when stationary. When the C critical box's are filled during damage there is a chance that a key system is knocked out (full details in the rules). 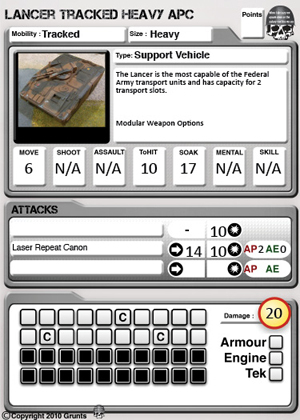 The Lancer APC benefits from a heavier weapon mount, so it can potentially do more damage to tanks and other support vehicles. 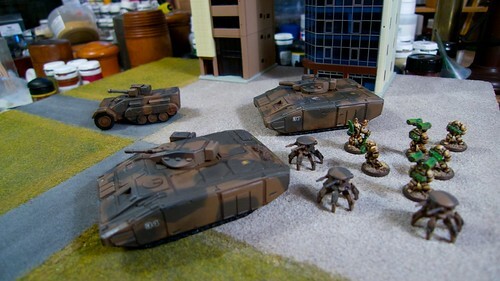 Both the Lancer and Dragoon are built to carry squads, with the 2 transport slots on the Lancer offering space for two Gruntz Squads or a mix of Gruntz and specialist support units. These are both v0.6 cards for the free PDF rules download and are now a bit out of date with vehicle cards and details updated since their release, however if you are just trying the rules they are ready to play and these cards (along with those on the Yahoo Group) will give you an initial feel for the game. 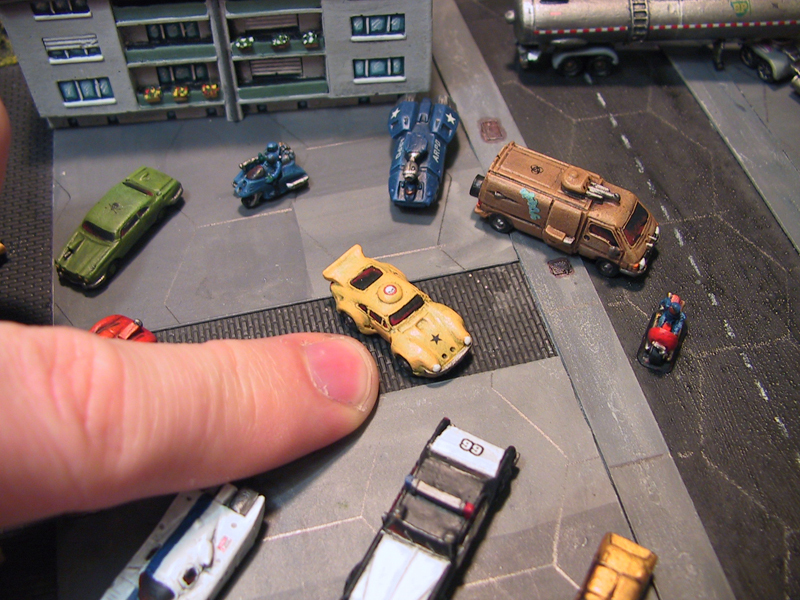 Kind of neat to have everybody else making miniatures for your game...huh? Yes it is neat :). Looking forward to seeing your new models soon! Very nice models, thanks for sharing them painted! I wholeheartedly recommend Old Crow. 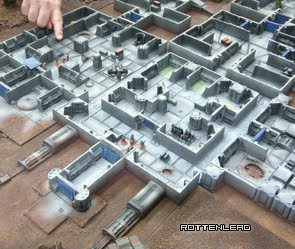 I bought a bunch of their 6mm buildings for use in Battletech, I found the quality unmatched. My order came to me in California within two weeks. I used many of the buildings in my Skondia battle below.